Simon Pagenaud, top driver of the Schmidt Peterson Motorsports team, sponsored by Magneti Marelli, last Sunday won the second race of the Belle Isle (Detroit) round of the IZOD IndyCar Series. 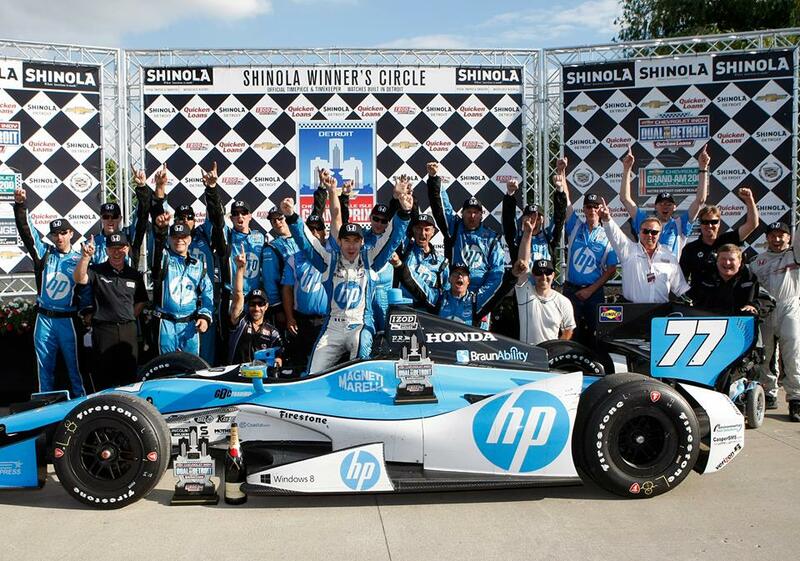 This is the first victory ever for Simon Pagenaud and for the Schmidt Peterson team in the IZOD Indycar Series and also the first success for Magneti Marelli in the Formula Indy as a team sponsor as well as technology supplier. Pagenaud and the team perfectly managed the first half of the race, implementing an effective strategy at a phase characterized by many accidents and related restarts. Thanks to the use of hard tyres for a series of exciting fast laps, Pagenaud knew how to get the best from his single seat no.77 at the decisive moment at 15 laps from the finish, when he managed to hold second place behind James Jakes to then overtake him three laps later, taking advantage of Jakes' pit-stop. Pagenaud was then able to hold the lead until the finish line, beating Jakes and also Mike Conway, previous day's winner of Race 1. The race ended with five Honda powered single seat at the top of the classification: Simon Pagenaud, James Jakes, Mike Conway, Scott Dixon and Dario Franchitti. Magneti Marelli Motorsport provides powertrain technology and fuel components to different teams of the IZOD IndyCar Series and it is a technical partner of Honda Perfomance Development (HPD). Magneti Marelli is technical sponsor of the Schmidt Peterson Motorsports team with its logo present and visible on the side and nose of Pagenaud’s single seat car. The partnership with the Schmidt Peterson Motorsports team is part of the framework of the strategic presence of Magneti Marelli within the context of international motorsport, in the shape of technological laboratory and incubator for the development of new technologies and solutions with possible application in production cars, fueling and inspiring new “green” solutions within the context of “sustainable mobility”. In the 2013 season that is already underway, Magneti Marelli has further expanded its presence as supplier of strategic systems and components for the main teams in the most important motorsport competitions worldwide. In Formula 1 all the single seaters use injectors customised by Magneti Marelli Motorsport. Magneti Marelli also continues this season to provide the top teams in F1 with a KERS (Kinetic Energy Recovery System) under braking, for which it produces primary strategic components such as the moto-generator, inverter and electronic control of the batteries. The WI-FI V2X Racing telemetry system, tested for the first time in 2012, is being used in the 2013 season for the transmission of information from the car to the pits. Compared to traditional telemetry instruments, this technology allows the real-time sharing of a greater amount of information between the car, pits and the technicians as well as voice transmission between driver and team. In addition to these systems, Magneti Marelli also provides various F1 teams with coils, fuel pumps, sensors and alternators. With regard to the new frontiers of F1, Magneti Marelli is working on a further development of the WI-FI V2X two-way data transmission system from vehicle to infrastructure that even has the option of sending HD high-resolution videos. 2014 will also be a challenge with regard to the Formula 1 fuel systems; Magneti Marelli Motorsport is now already testing injectors and pumps for GDI engines with fuel pressures up to 500 bar. Magneti Marelli also offers HV high energy coils for turbo engines and electronic control units (ECU) for the control of GDI injectors and HV ignition coils that will use a new electrical multi-voltage system architecture. As part of the Le Mans Prototypes (LMP) Championship, top teams use telemetry, data acquisition systems and Wintax analysis tools supplied by Magneti Marelli. In view of the changes in regulations scheduled to take effect in 2014, Magneti Marelli is also developing the ERS system (Energy Recovery System) for LMP that combines the KERS (Kinetic Energy Recovery System) technology with the HERS (Heat Energy Recovery System). In relation to FIA GP2 and GP3 series, Magneti Marelli supplies all the teams with the complete engine control system, the electro-actuated transmission and the data acquisition system with Wintax software. Moving on to the rallies, in the WRC (World Rally Championship) Magneti Marelli is the official supplier to the Citroën team. Among the various products used on the Citroën DS3 WRC, the electronic engine control units and data acquisition modules including Wintax software are particularly noteworthy. Continuing with the WRC, Magneti Marelli has already developed a number of GDI injectors (with high pressure) for the races. Magneti Marelli also supplies components for the automobile electronic control system to Skoda, which competes in the ERC (European Rally Challenge) with a Fabia Super 2000, and to the PSA Group for cars used in various rally competitions at international level. Magneti Marelli has a presence in China in the CTCC (China Touring Car Championship) with the data logger chosen by the FASC (Federation of Automobile Sports of the People's Republic of China) and fitted on all the cars competing in the championship for the analysis, balancing of performances and compliance with the regulations. The Magneti Marelli Motorsport data acquisition system was also adopted for the same purposes in the WTCC (World Touring Car Championship), WRC, ADAC GT, GT1/GT3 and in the Italian GT championships. In the USA , Magneti Marelli supplies components for ignition and fuel components in the IZOD IndyCar Series championship where a technical partnership with Honda Performance Development (HPD) was also signed aimed at the development of powertrain components for use in the IZOD IndyCar Series championship for which HPD produces, prepares and develops the Honda V6 turbo HI13RT engine fitted with direct injection. The agreement calls for Magneti Marelli and HPD to widen the program to include within the technical partnership other high quality motorsport competitions, such as, for example, the WEC (World Endurance Championship) and the North American Road Racing that from 2014 will combine the American Le Mans Series with the Grand-Am Championship. Continuing with the 2013 season of the IZOD IndyCar Series, Magneti Marelli is sponsoring and supporting the Schmidt Peterson HP Motorsports (SPM) team with technologies and in particular the single seater no. 77 of Simon Pagenaud. In the American Championship NHRA (National Hot Rod Association), Magneti Marelli, together with Mopar, is sponsoring the Dodge Charger R/T dragster driven by Matt Hagan, of the Don Schumacher Racing team, currently at the top of the championship. With regards to motorcycling, Magneti Marelli offers all the teams of MotoGP™ the option of fitting the Electronic Control System on board the motorbikes that includes an engine control unit (ECU) and chassis with built-in datalogger, as well as strategic instruments for fine-tuning vehicle stability and data analysis, the dashboard, the push-button panel on the handlebars and the inertial platform for dynamic and stability control of the motorbike. For the third year in a row Magneti Marelli is also directly involved with the Federation (FIM) for supply of the pressure regulator to all the MotoGP™ teams in order to ensure performance and compliance with the regulations through a suitable certification of the item within the set limits. Again with MotoGP™, Magneti Marelli Motorsport is supplier of Yamaha and Ducati for key components such as electronic engine control units, data acquisition, coils, injectors, alternators and pressure regulators. In the World Superbike Championship (WSBK), Magneti Marelli supplies the Kawasaki team with the engine control unit, data acquisition system, dashboard as well as the inertial platform that is used to define the degree of inclination of the motorbike. For Ducati, the contribution of Magneti Marelli Motorsport is significant, through the supply of the electronic engine control unit with built-in data acquisition system. Magneti Marelli components are also fitted in Aprilia systems. Magneti Marelli Motorsport Components and ECU engine control for the World Supersport Championship and in the AMA SUPERBIKE American Championship where Magneti Marelli supplies the engine control unit, electronic modules and components to the Yamaha, Suzuki and KTM teams.